Dinosaur Feathers – Even On Tyrannosaurus rex? 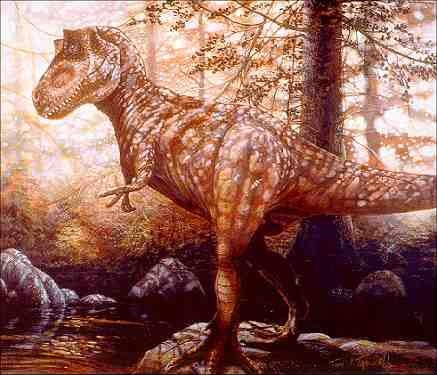 Tyrannosaurus rex dinosaur painting © by artist Tony Trammell in Dinosaur Illustrations. March 9, 2002 New York City, New York - This week I talked to a scientist who is confident that many dinosaurs had feathers, including the fierce Tyrannosaurus rex "monster" meat-eater, - or at least when it was young. Dr. Mark Norell, Chairman of the Paleontology Division at the American Museum of Natural History in New York City, published photographs and information about a new fossil discovery from the Liaoning Province in northeast China in the March 7th journal, Nature.